There is a very encouraging movement across the United States where communities or groups of people are pooling their resources to establish local renewable energy projects. Sometimes these projects are called "Solar Gardens" and are based somewhat on the model of community-owned vegetable gardens. Rather that individuals creating their private home-based solar electric arrays that just serve their own home (or send any extra electricity out through the existing grid), Solar Gardens can be located at some distance from the participating folks who simply choose to join with others to own the facility. 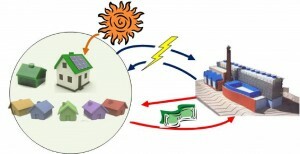 This means that even if you rent, or your home is not suitable for locating solar panels, you can still become a participant in creating real renewable energy. Often these are organized so that people buy shares in the project and then reap the benefit of getting paid by the local utility company for their share of the electricity that is produced. Sometimes the solar array will be located on the roof of a local business or community building, but it could be anywhere that the sun shines all day. Photovoltaics require very little maintenance, especially if there are no batteries involved (which are not needed if the intention to intertie the system with the electric grid), which makes such projects even more feasible. Most states now have provisions for electric utilities that requires them to buy back independently produced power, so Solar Gardens could be sprouting up all over the place. The Solar Gardens Institute can give you much more information about how to make a Solar Garden happen in your neighborhood. The Clean Energy Collective assists with establishing community owned renewable energy facilities. What a great way to participate in greening the way your electrical energy is produced! Here in the UK, the government and the banks are encouraging the use of solar panels like what you guys are doing in the US. Our government are providing feed in tariff incentives for households producing solar energy. Banks are also approving solar panel installation loans.